On Nov. 10-11 hundreds of attendees from across Southern California and beyond showed up for the inaugural Grow Local OC Conference: The Future of Urban Food Systems held Nov. 10-11 in Orange County, CA at California State University, Fullerton to learn more about the community and economic development potential of fostering local food systems in cities. The conference attendees were treated to lectures from the foremost urban farming experts, entrepreneurs, and community advocates in the sustainable and local food system space. Topics explored by the speakers and panelists included the role that food plays in bridging the rural urban divide, the potential for urban farming to generate community and economic capital, the challenges faced by entrepreneurs seeking funds for their local food and farming ventures, the potential for controlled environment agriculture in cities, and the power of community development initiatives to increase access to healthy, local food. The conference provided ample opportunity for the local food champions, entrepreneurs, and advocates in Orange County to continue to strengthen their base of support to increase food access, improve health outcomes, and meet the demands of a thriving local food marketplace. Seedstock Founder, Jason Reed kicked off day one of the conference proceedings by noting the huge community and economic development opportunity inherent in fostering and strengthening urban food systems in cities and counties across the country. He also outlined a future in which people would see food not only as nourishment, but also as medicine to fuel a healthier society. Christina Hall, Executive Director of the OC Food Access Coalition echoed his sentiments. She also noted that while Orange County is perceived from depictions on television as a center of wealth in Southern California, there is a hidden demographic that lives in poverty and suffers from food insecurity. Hall noted that 50% of K-12 children in the county receive free, or reduced price lunches. The conference’s keynote was delivered by Karen Ross, Secretary of the California Department of Food and Agriculture. Secretary Ross delved into the importance of agriculture and local food systems in cities. She spoke about innovative agricultural systems and noted that modern farming and passionate local farmers are taking us from “calories to survive” to “nutrition to thrive.” She also spoke of the vital and necessary role that food plays in bridging the rural urban divide. “Food is a connector like no other,” she said. She also highlighted the state’s commitment to help small urban farmers succeed and become a viable component of the food system. Secretary Ross’s keynote was followed by a panel focused on ‘Connecting Stakeholders to Foster a Robust Local Food System’ in Orange County. The panel was moderated by Dwight Detter of Slow Money SoCal and featured panelists Kimi McAdam of Kaiser Permanente’s Nutrition Services department, Christina Hall of OC Food Access, Mark Lowry, Executive Director of OC Food Bank, and Farmer Glenn Tanaka of Tanaka Farms. 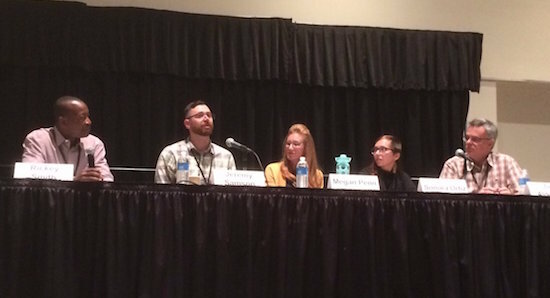 The panel explored the connective tissues that align local stakeholders and enable them to foster a local food system predicated on impactful food policy, and shared community and economic development goals. McAdam underscored the importance to Kaiser Permanente of sourcing sustainable local food. McAdam noted the hospital group is looking for solutions to source more local food, and said that “we’ve always worked with big distributors, but do we have to?” Mark Lowry of the OC Food Bank noted that to really have an impact local farmers need to produce volume. Farmer Tanaka discussed the importance of agri-tourism and educational programs in helping to bolster the economic viability of his farm. ‘Community Development and Access to Healthy, Local Food’ panel featuring (from left to right) Rickey Smith of Urban Green, Jeremy Samson of Slow Food Orange County, Megan Penn of Orange Home Grown, Sonora Ortiz of the Downtown Santa Ana Farmers’ Market, and Tim Alderson of Solutions for Urban Agriculture. Photo credit: Robert Puro, Seedstock. A farm-to-fork networking lunch featuring aquaponically grown greens served up by sponsor Oceans & Earth Restaurant followed. The afternoon sessions, which followed, featured panels on the practicalities of urban farming, the potential for controlled environment farming in the city, finding funding for local food and farming endeavors, and a keynote address on the urban agriculture opportunity in California from Dr. Rachel Surls, Sustainable Food Systems Advisor for UC Cooperative Extension – Los Angeles County. A discussion of the economic potential of indoor agriculture in cities and how it is strengthening local food systems was moderated by Chris Higgins or Hort Americas and featured panelists Nate Storey of Bright Agrotech, Chef Adam Navidi of Future Foods Farms, Ed Horton of Urban Produce LLC, and Erik Cutter of Alegria Fresh. In acknowledgement of those that question the wisdom and need for indoor farming, Chris Higgins of Hort Americas asked, “why are we the only industry that turns its back on technology?” In response to a question about the food justice implications of indoor farming, Nate Storey of Bright Agrotech countered by that controlled environment agriculture is primarily a commercial opportunity. “It’s not set up to serve outliers,” he said. Attendees then ended the day over cocktails and flat breads at Oceans & Earth Restaurant in Yorba Linda. 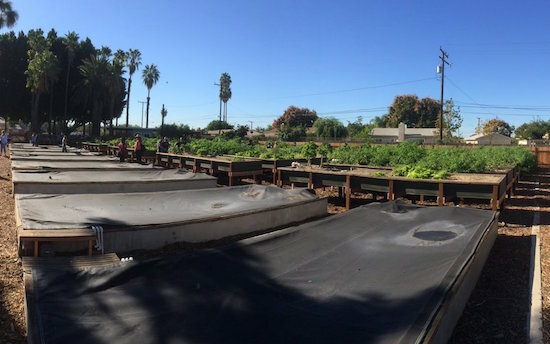 The Grow Local OC – Future Farm Field Trip visited The Riverbed in Anaheim, an aquaponics community farm that uses minimal water to operate and produces over 2,000 pounds of food for underserved residents. Photo credit: Robert Puro, Seedstock. Day two of the conference featured the “Future Farm Field Trip” on which a select group of attendees paid visits to urban and indoor agricultural operations to bear witness to the innovative local food endeavors that are stimulating community and economic development in Orange County. The field trip kicked off with a stop in Anaheim at The Riverbed, an aquaponics community farm that uses minimal water to operate and produces over 2,000 pounds of food for underserved residents. Then it was on to Alegria Fresh in Irvine where attendees ate lunch provided by sponsor Tender Greens, and learned from Erik Cutter about the importance and vitality of soil as well as how urban microfarms can supply communities with locally grown, fresh produce while reducing transportation and preserving natural resources. The tour then moved on to Irvine-based Urban Produce LLC, an indoor vertical farming operation that uses advanced hydroponic technologies in a controlled environment. The day, as well as the conference, concluded at Chef Adam Navidi’s Future Foods Farms, which produces all organically grown products in several 2,000-4,000 square-feet greenhouses, and is one of the largest aquaponic farms in the state.